1 How to Migrate Teletalk Oporajita Prepaid SIM or Collect New SIM? 2 How to activate Teletalk Oporajita SIM 1GB 8 TK Internet Offer? 3 How to activate Teletalk Aparajita SIM 2GB 14 TK Internet Offer? Teletalk Oporajita SIM Offer 2019! Welcome to Teletalk Oporajita Prepaid Package – 1GB@8TK | 2GB@14TK Internet Offer – www.teletalk.com.bd Content. The Bangladeshi Government telecommunication company Teletalk brings a special prepaid package only for Women, which name is “Teletalk Aparajita Prepaid SIM”. The Teletalk Oporajita SIM is a special SIM for Internet. After activating Teletalk Aparajita SIM, customer can buy 1GB @ 8 TK and 2GB @ 14 TK Internet Offer, any time in a day. So, it is very big opportunity to enjoy cheap rate Teletalk Internet Package for Bangladeshi Women by activating Teletalk Oporajita Package buy a new Oporajita Teletalk SIM or Migrate Teletalk Aparajita Prepaid Package. Under this Teletalk Oporajita Package, Women customers are enjoying Teletalk 1GB Internet 8 TK Offer and Teletalk 2GB Internet 14 TK Offer and special call rate. The Teletalk Oporajita SIM is fully free. 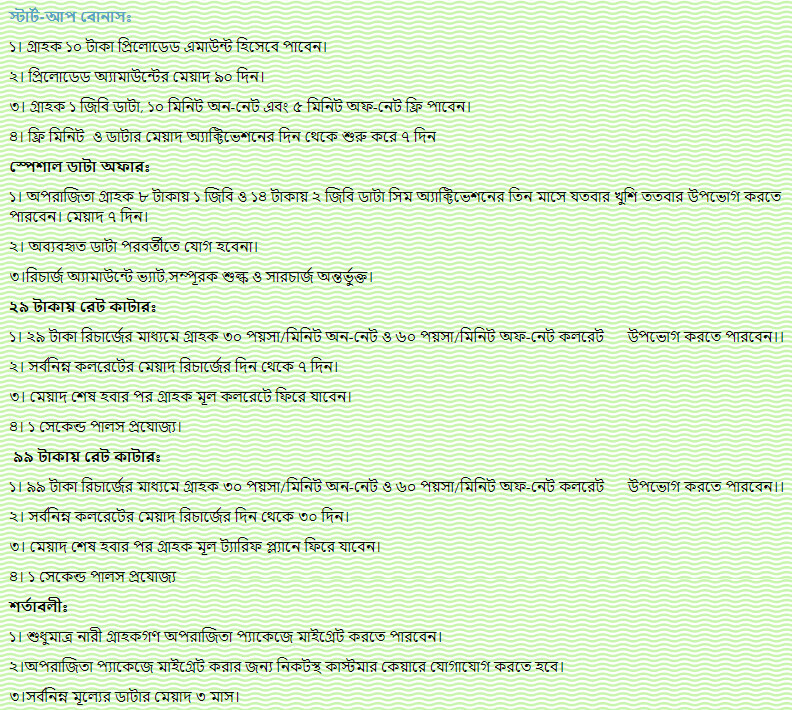 So, it is very easy to collect Teletalk Aparajita Package SIM from Teletalk customer Care. If you want to know more about the Teletalk Oporajita Package, just follow the below information. How to Migrate Teletalk Oporajita Prepaid SIM or Collect New SIM? The common question of all the Teletalk Oporajita eligible women, how to get Teletalk Oporajita New SIM or How to Migrate Teletalk Aparajita Prepaid SIM? If you want to buy a new SIM go to the Nearest Teletalk Customer Care with NID, NID Photocopy, Passport Size Picture or Migrate, just go customer care. The Customer care agent fully helps you complete this step and get Teletalk Prepaid Oporajita SIM. How to activate Teletalk Oporajita SIM 1GB 8 TK Internet Offer? After collecting or Migrate Teletalk Aparajita Prepaid Package, the customers are searching how to activate Teletalk Aparajita SIM 1GB Internet 8 TK Package. This is a very easy system to activate Teletalk Prepaid SIM Oporajita 1GB 8 TK Internet Offer, Just recharge 8 TK and wait few second. The Oporajita Teletalk 1GB Internet Package 8 TK offer activates automatically. How to activate Teletalk Aparajita SIM 2GB 14 TK Internet Offer? It is the same system Teletalk Oporajita SIM 2GB Internet 14 TK Offer like as Teletalk 1GB 8 TK Oporajita SIM Offer. Just go to the Flexi-Load shop and recharge 14 TK. After recharging exact 14 Taka, the Oporajita Teletalk Internet Offer 2GB @ 14 TK package will activate automatically. Eligible Customer can activate the Teletalk 1GB 8 TK and 2GB 14 TK Oporajita SIM Internet Offer as many times as they want until 3 months, after activating the Oporajita SIM Teletalk Package. The Validity of Teletalk Aparajita 1GB 8 TK and 2GB 14 TK Internet Package 7 Days. To check the Oporajita Teletalk SIM Internet Balance, Just Dial *152# and mane more here – All Teletalk Balance Check Method. VAT + SD + SC is included in recharge amount. Thanks for staying with us a long time and visiting Teletalk Oporajita Prepaid Package – 1GB@8TK | 2GB@14TK content. If you have any question about the Teletalk Aparajita Prepaid Package SIM? Just comment here. We reply as soon as possible.